Our office is open from 8:30 AM to 5 PM, Monday through Friday. We are closed for lunch 12 PM to 1 PM. Evening Urgent visits are available Wednesdays 5pm-6pm. Saturday AM Urgent visits are available by direct arrangement with the on-call physician. In order to deliver the best care and to be fair to others with scheduled routine appointments, please call as early as possible in the morning if your child needs an urgent appointment. Automated Appointment Reminder: We are now using an automated appointment reminder system. When an appointment is created for your child, you will receive an automated reminder call at your preferred number 24 hours before the appointment. There must be a response to the phone call before the message will play. This is an automated system; please listen to the message in its entirety. At that time patients can confirm or cancel the appointment over the phone. We share call and hospital rounds with Dr. James Bonner and Dr. Carine Leconte. Their office is located at 1150 Reservoir Avenue, Cranston, RI. If your child needs care outside of normal business hours, please call our office number to reach the on-call physician. Your call will be answered by an answering service. A physician will return your call within one hour or you will be given the number of a nurse help line to call. The on-call physician is available if the nurse cannot help you. Sick visits on Saturdays must be arranged directly with the on-call physician, so please call early in the morning. If you deliver your baby at Women & Infants Hospital one of the four doctors will see your child in the hospital within 24 hours. Your child will be on the Hospitalist service if he/she is admitted to Hasbro, but we will be kept informed of your child’s progress. Please bring your child’s updated insurance card to your office visit. Contact and insurance information needs to be updated yearly. Please notify us immediately if there are changes in this information at any time. Patients that fail to show up for their appointment and do not call the day prior to the scheduled appointment will be subject to a $25.00 NO SHOW FEE regardless of Insurance type. Co-payments are due when you check-in. We accept cash, personal checks, and visa/mc and flex-care cards. Our patients are very active in school, summer camps, sports and other activities that require health forms to be completed. These forms are often complicated and take time to complete. Please allow 3-5 business days to have your forms completed. Please be sure to have the patient’s name and date of birth on the form. We ask that you come in to pick it up as this is your original document. The Annual Physical form is free, any form requested after that visit will require a $5 charge for each sport, camp or school form completed. There is no charge for WIC forms. Please notify the staff if this charge presents a financial hardship. Prescriptions are now sent electronically. Please call your pharmacy directly for refills. Please turn off cell phones while at our office. Please take home any soiled diapers. Bags are available upon request. If your insurance requires a special referral form (i.e. Tufts), please allow time for our staff to process the form and fax it to your specialist. As patients become adolescents, they take more responsibility for themselves and for their own health care. We want both patients and their parents to understand this increased independent role of the adolescent, and that our primary concern and responsibility is for them and for their needs. We encourage our adolescent and young adult patients to speak with us directly, and to feel free to discuss with us any concerns that they may have about their health. On some occasions, there will be issues, such as sexuality and substance abuse issues, that our patients discuss with us that will be kept confidential. We encourage this type of honest discussion, and it is our policy to keep this type of information confidential, with the exception of issues that might be life-threatening. Our providers participate in almost all of the insurance plans available in the State of Rhode Island. In particular, we participate in Blue Cross/Blue Shield plans, Medicaid/Rite Care and United Healthcare. We DO NOT participate with Neighborhood Health Plan. If your plan requires a co-payment for office visits, we ask that you pay it at the time of each visit. If you have a high deductible plan, please read our Credit Card On File Policy here. Comprehensive Practice Management Services, Inc.
We try to keep our charges as reasonable as possible. In order to reduce our billing charges and keep our costs down, we ask that you supply us with your CURRENT insurance information and co-pay at time of service. If you find your bill is a financial burden, we can help by making your payments smaller and or extending our terms. Please ask to speak with the office manager, Kathleen, to make arrangements. We will be as flexible as possible in working out a payment schedule if needed. In cases of divorced parents, or in the event a friend or other relative brings your child to be seen, we ask that person to be responsible for paying the bill or co-pay. A copy of the receipt can be used to obtain reimbursement. We accept many insurance assignments. Ask our staff if yours is one of them. In cases where we do not carry your insurance, a receipt will be given at the time of the visit to submit to your insurance company. Please be advised that our policy regarding the transfer of medical records is such that parent, guardian, or patient of legal age must sign for them to be released. Once the transfer fee of $25.00 per patient is paid the records will be released. You should also pay any balances on the account at this time. Please allow at least thirty days for processing the release of your child’s medical record. 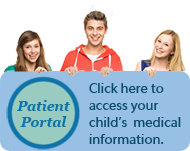 If your child is a new patient please contact us at 401-231-3138. You may print a transfer of records release or new patient form by clicking on the forms tab.